New March Pathfinder Society Scenarios! As we started working on Season 10 of Pathfinder Society, we knew that there were a lot of long running storylines that we wanted to resolve—and as importantly give players the opportunity to see through to the end. This month we're debuting the finale for the Gloomspires as well as a deep look into the famous Decemvirate helms! In Pathfinder Society Scenario #10-16: What The Helms Hide, a series of four quests for Tier 1–5 written by Calder CaDavid, Lysle Kapp, Kendra Leigh Speedling, and Nate Wright (we're excited to welcome Calder and Lysle as our latest open call authors). In this adventure, the PCs are given the opportunity to take a peek into the past of the most mysterious members of the Pathfinder Society. For over three centuries, the Decemvirate guided the Society from behind the anonymity of their magic helms, though their rule has not always been praised by the agents and other members of the Society. Over the course of the past decade, the Society has faced rebellion, treason, and other threats from within, as well as external menaces. Thanks to the tenacity and strength of its agents, the Pathfinder Society withstood the turmoil, but questions about the Decemvirate and the secrets possessed by those whose identities are hidden behind the magic helms still remain. The Society's Master of Scrolls, Kreighton Shaine recently discovered clues left by a long-ago member of the Society exiled for a foiled assassination attempt against one of the members of the Decemvirate. These clues seem to indicate that the purported assassination may not have transpired quite as the history books claim. Supported by members of the Decemvirate who believe this to be exactly the kind of secret that could weaken the Society at a critical juncture, Kreighton sends the PCs to key locations across the Inner Sea to track down these clues and reveal the secrets hidden at the heart of the Grand Lodge. Whether you're a dedicated believer in the Decemvirate and their actions, or a fiery rebel carving “Shadow Lodge for life!” into the doors of every Grand Lodge privy, you won't want to miss your chance to find out what kind of secrets and dark histories are hidden in the veiled past of the Pathfinder Society's most enigmatic figures! The legendary tomb of pirate captain Sempet Sevenfingers captivated sailors throughout the Shackles for generations, perhaps none more so than Venture-Captain Calisro Benarry. Over the last few years, Benarry sent numerous Pathfinder teams to explore and plunder the depths of the Gloomspires: haunted stone spires rising from the stormy sea infused with strange dimensional magics and filled with all manner of perils. Yet none of these ventures uncovered Sevenfingers himself or his greatest treasures. That's about to change, as you might have guessed from Josef Kucera's illustration of the nefarious captain himself. The old pirate hasn't been sitting quietly in his tomb. He has big plans, and if the PCs don't stop him quickly, his triumphant return could spell disaster for the Shackles! Come play the grand finale of the Gloomspires story arc, Pathfinder Society Scenario #10-17: On Sevenfinger's Sails. And if you particularly want to challenge your PCs, consider playing the scenario's optional Hard Mode. Author Tom Phillips invented the Gloomspires as a part of his 2012 RPG Superstar submission, and this fascinating dungeon's rich story was something the Organized Play team wanted to explore further. He's been working with us ever since to gradually reveal its buried secrets. Check out the rest of the Gloomspire's story in these scenarios: Pathfinder Society Scenario #6-06: Hall of the Flesh Eaters, Pathfinder Society Scenario #7-19: Labyrinth of Hungry Ghosts, and Pathfinder Society Scenario #8-15: Hrethnar's Throne. Since when is Sevenfingers a pig? Why does he have all 10 fingers? Isn't the PFS1 finale also set in the Gloomspires? How is this the grand finale of the Gloomspires? Perhaps some sort of demonic minotaur? No, the finale is the Gallowspire. I think the PFS1 Finale is set in Gallowspire, not Gloomspires. Dibs! On 3 of Sempet's fingers after we destroy him. I was wondering why there were only 4 quests and then I realized what you did. Clever. I just came here to have a good time, and honestly, I'm feeling so attacked right now. Thank you all for helping dispel my 7/10th of my confusion. The blog doesn't mention the level range for Sevenfingers. It's 7-11. ..Obviously he regenerated those lost fingers using divine magic to avoid being recognized. Time to finish my Gloomspires table and run them all! On the basis that you used marker ? Sempet: Little do they know that by waiting for this once-in-a-millennium astronomical alignment, performing this ritual, and recovering this artifact, I shall at last have the power to...REGROW MY LOST FINGERS—AH HA HA HA HA!!! Calisro Benarry: A'ight, Pathfinders, here's the deal. Sempet Sevenfingers is up to something, and it's our job to stop him. PCs: Okay, but he's doing something evil, right? Like, he's a villain who deserves to be stopped? Calisro Benarry: *Takes a long drink from her rum jug and passes it around* Sure. That sounds plausible. Let's go with that. I believe the Valsin term for Sevenfingers' appearance would be Leng Ghoul those seem to be ears sticking out of the hat with the rings rather then horns. Would explain the hooves and the ties with that "plane". 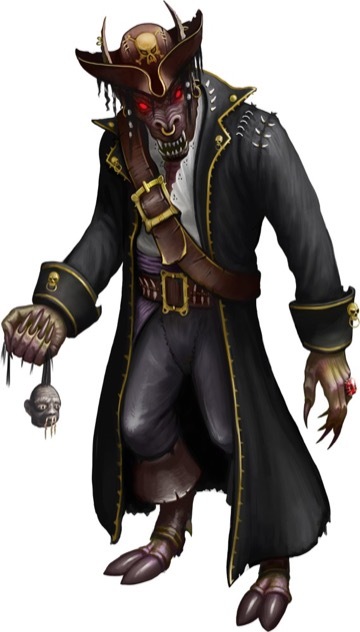 Also brings into question those earlier accounts regarding the dread pirate's race, because I think the whole being an explanar undead would be hard to miss or leave out of his legend or notoriety, unless this is a new development for this nautical evil doer. But that's like if One-Eyed Willy grew a new eye! Yeah, well, the story they never tell you is that Willy was a cyclops. Suddenly Two-Eyed Willy is a lot more interesting. Sempet was a seven-fingered human, once. I like to imagine him looking in the mirror after his transformation and being like "OK, the new snout and hooves are fine. But why do I have TEN FINGERS???" This scenario is the finale of the Gloomspires arc, rather than of the whole campaign. Oh, another Gloomspire scenario! Swoon! Last post: 7 hours, 36 minutes ago by Muse.